The Transformation domain is made up of many parts. These parts are in constant motion and all are trying to do the best that they can. Even if those parts start off being synchronised and working together, over time they tend to become de-synchronised and in some cases even start working against each other. None of the parts want to work against any other part but the context they all work within does not tend to lend itself to helping the individual parts. 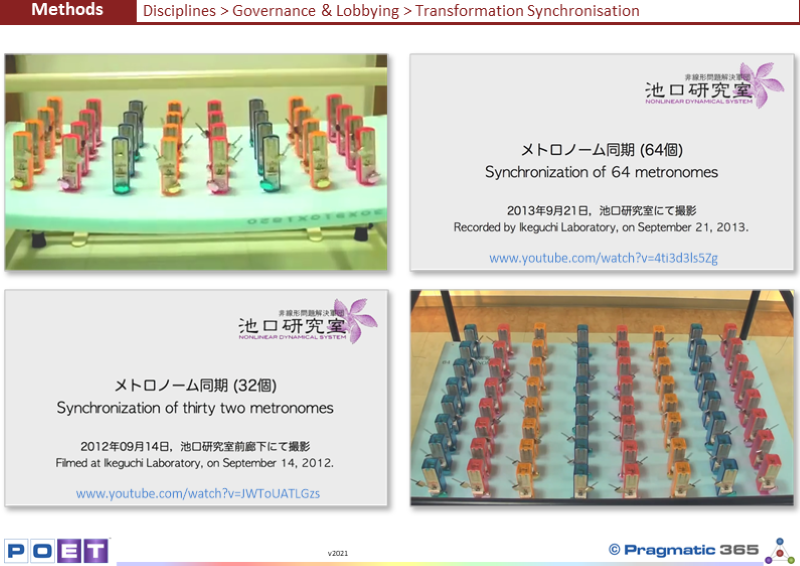 Here we see the results of two experiments run by the Ikeguchi Laboratory in 2012 and 2013. A number of metronomes (32 or 64) are placed on a solid platform. Since there is something that is rigidly connecting the metronomes together you might think that this will help them synchronise. When we think about this in the physical world it is immediately obvious that just placing the metronomes on a common fixed surface will not cause them to synchronise, for while they are all “connected” there is no “communication” between them. This fixed surface can be thought of as the Governance that is performed during Transformation. Governance is the thing that we try to use to keep all parts joined up, synchronised, working toward a common goal, and connecting strategic intent to the changes that are ultimately deployed. But since governance is not a physical thing, it is not obvious that this alone will not work - although everyone expects (hopes) it will. However, while the fixed surface (Governance) is definitely required, the key to synchronisation is Lobbying. Lobbying is a subtle feedback loop, represented here by the fact that the fixed platform (Governance) is suspended. This suspension (Lobbying)of the platform (Governance) allows the platform itself to move slightly, and it is this (almost imperceptible) movement that causes the metronomes to synchronise. There is no outside force doing the synchronising, Synchronisation occurs because the metronomes collectively synchronise themselves. Are the people working in your Enterprises Transformation domain, synchronised? If not, what problems does this create? If not, what can you do to help the synchronisation?